Kashmiri kids warm themselves with the traditional fire-pot (Kangri) during a cold winter day on the outskirts of Srinagar. As it snows, the smoke billowing landscape of Kashmir Valley becomes the sightseers’ delight during winters. Spreading riveting colours, the frosty season offers its own picture perfect — serene surroundings, pepper mint fresh air, and a sense of retreat and recreation. It largely turns life sluggish in the snowbound Vale by sending natives into a semi-hibernation mode. The bare wickers and Chinars, the weather-beaten faces and spirits, and the larger unsettled regional background further make the winter some kind of a surly spell for some. But this seasonal distress betrays the liveliness, coming from places like Gulmarg—a wonderland of winter sports and leisure in Kashmir. As local and international ski enthusiasts flock the “meadow of flowers”, the whole experience and meaning of winter changes. In parts of the countryside, however, life largely passes through a sleepy, frozen timeline. Down in the new and old bazaars of the city and towns, the Kangri makers and charcoal suppliers make rounds to uphold their traditional trade in times of other heating appliances. On streets, hawkers and shopkeepers can be seen sitting around bonfires, while some countrified folks keep frequenting towns to sell seasonal delicacies. Amid this pervasive wintry mood, the Old City markets remain flooded with dried vegetables. These vegetables give the valley a unique distinction and remind many of Kashmir’s hoarder way of life. Many people prefer eating these seasonal delicacies as part of a tradition, which in times of yore would help natives survive the harsh winters—when snow would block the route and food supplies coming from outside for months together. As part of preparation before the advent of winters, Kashmiri households—especially in old towns—put vegetable garlands hanging near their windows. With onset of winter, as these vegetables turn dry, people start consuming them. 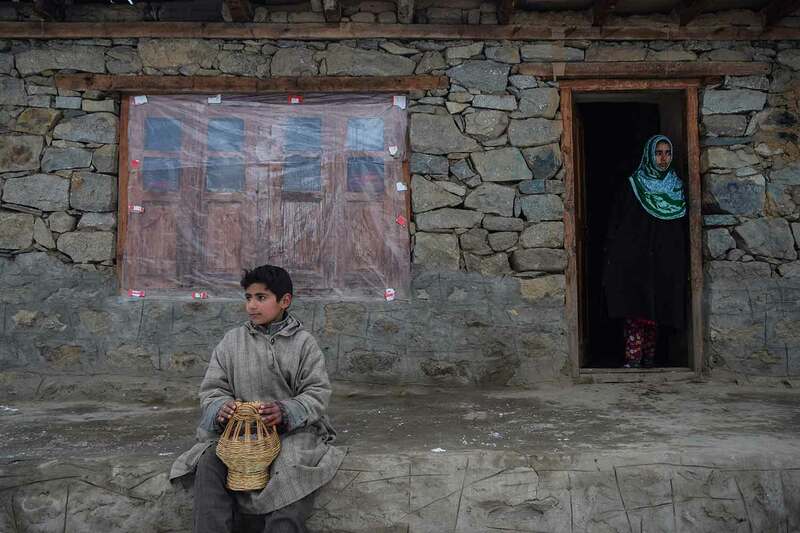 For children of Kashmir, grappling with uncertain and siege-like situation in their backyard, the winter largely comes with a sense of hiatus—if not as a spell of relief, in the form of vacations. Although much of the bygone winter delight has already faded with dawn of gizmos and 4G Smartphones, the snow-draped streets and courtyards still trigger snow fights and snowmen making adventure. As the perpetual homeland blues have sparked a creative boom in Kashmir’s young population, especially post-2010, some of them now put their restive minds on snow and use it as a canvas to portray different shades of their homeland. This creative display has come as the new melting expression, at the time of heightened offensive in the region awaiting a political solution. 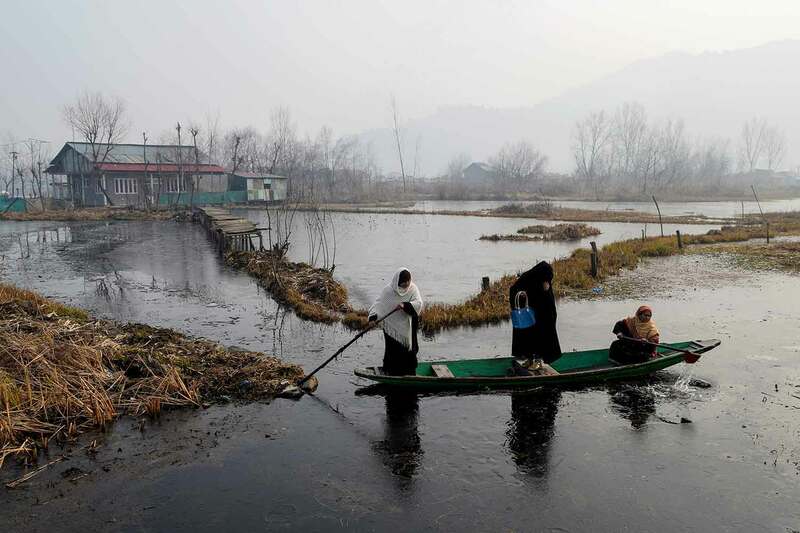 Kashmiri women break ice with an oar as they try to make their way on the partially frozen part of Dal lake during a cold winter morning in Srinagar. Kashmiri men warm themselves around a bonfire during a cold winter morning in Srinagar. 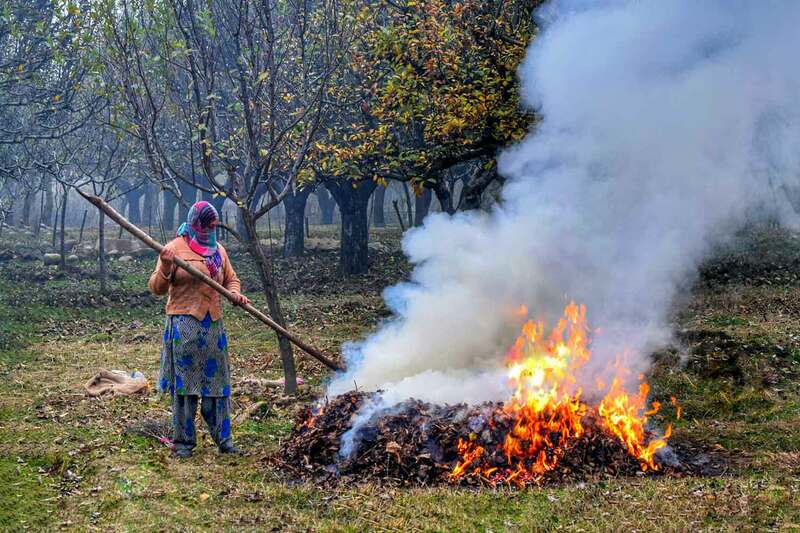 A Kashmiri woman burning tree leaves and branches to make charcoal used in traditional fire-pots (Kangri) during winter season in Kashmir. 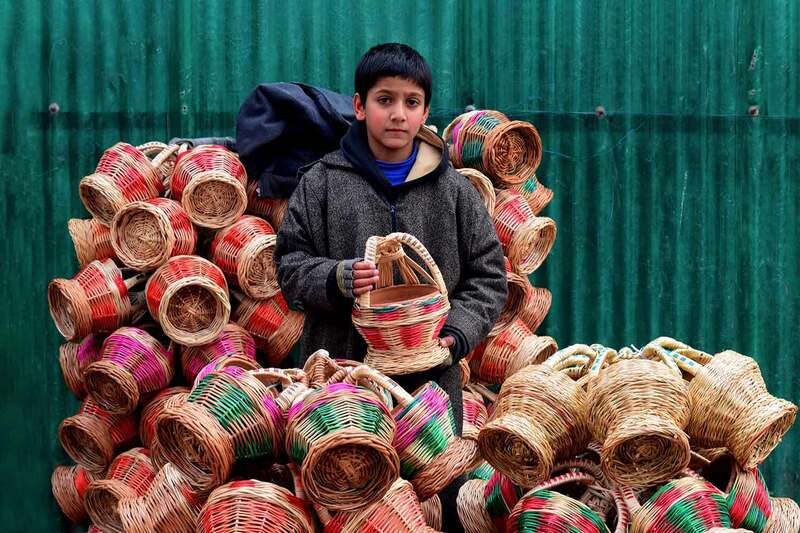 A Kashmiri boy selling traditional fire-pots (Kangri) during a cold winter day in Srinagar. A Kashmiri vendor selling dried vegetables and spices in Srinagar. Kashmiri boatmen taking a mid-day nap on their boats at Dal Lake during a cold winter day in Srinagar. A Kashmiri man chops firewood at his home during a cold winter day on the outskirts of Srinagar. A Kashmiri boy warms himself with the traditional fire-pot (Kangri) during a cold winter day on the outskirts of Srinagar. The windows of house have been covered with plastic sheets to shield the inmates from cold. A Kashmiri boatman ferrying his passenger on the waters of Dal Lake amid snowfall in Srinagar. A Kashmiri boy enjoys snowball fight popularly known as (Sheen-Jung) after snowfall in Srinagar. Kashmiri boys walking through a snow-covered lane going for their evening study classes on the outskirts of Srinagar. Kashmiri men walk on the banks of Dal lake during a sunset after snowfall in Srinagar.